A sting in the tail for those transients. HoRNet plugins has released Spikes, an audio transient manipulation plugin. Spikes features auto release and auto output adjustment functions that allow you to adjust the 'spikes level and you can also make finer adjustments to the detected peak length and the release speed. You can also reduce the weight of low frequencies thanks to the detector high pass filter and impose an upper and lower limit to the gain applied. 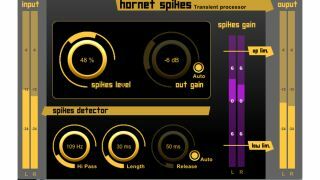 HoRNet Spikes is available for €12.99 for Mac and PC in VST2, VST3, AU, RTAS and AAX plugin formats. Head on over to the HoRNet website from more infomation.